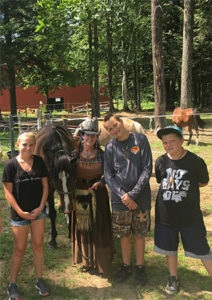 The HHB Healing Foundation utilizes horse coaching to facilitate connection, healing and empowerment for those in need. It operates out of the Human Horse Balance Ranch in Center Conway, New Hampshire. In order to serve as many individuals and groups as possible (regardless of ability to pay), the Foundation welcomes donations and volunteers! All donations are tax deductible as the Foundation is a non-profit under IRS 501c.3. Contributions are greatly appreciated and fundamental to our success! Thank you for your support. Any donation is tax deductible, greatly appreciated and will help us provide these services to those in need!